Apple has released iOS 11.1 beta 2 and macOS High Sierra 10.13.1 beta 2 for users enrolled in the iOS and macOS beta testing programs. Additionally, the second beta versions of watchOS 4.1 and tvOS 11.1 are available for those in the beta testing programs. 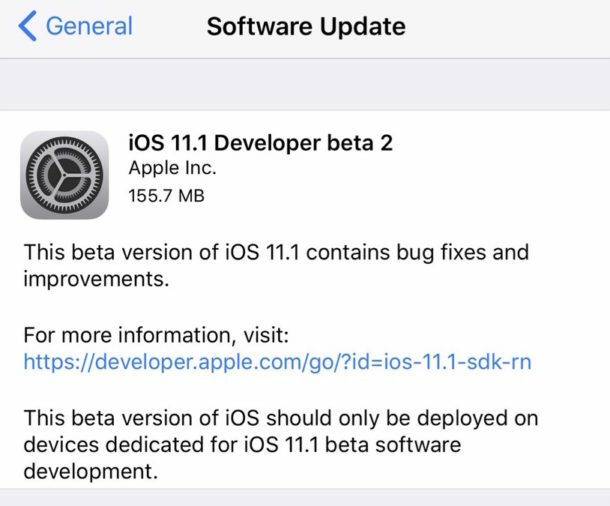 iOS 11.1 beta 2 aims to include various bug fixes and enhancements, and also features hundreds of new emoji icons, including gender neutral characters, dinosaurs, a pretzel, an “I Love You” sign language hand gesture, a wizard, grasshopper, broccoli, a person wearing a headscarf, a bearded person, a nursing mother, zombie, and many others. macOS High Sierra 10.13.1 beta 2 also aims to focus on bug fixes and various enhancements, and also includes access to the hundreds of new emoji characters. tvOS 11.1 beta 2 and watchOS 4.1 beta 2 also aim to address bugs and new emoji support. Users who are enrolled in the respective beta testing programs can find the latest versions available through the software update mechanisms on their devices. In iOS, that is through Settings > General > Software Update, and in macOS that is through the App Store Updates tab. Apple typically release beta versions to developers first, and soon after unveils the same beta release to those in the public beta testing programs. The most recently available stable version of iOS is iOS 11.0.2 for iPhone and iPad, and for macOS is the Supplemental Update to macOS High Sierra 10.13 which is a different release from the original High Sierra build but does not change the version number of the Mac system software. At what point does every possible word exist in emoji and we devolve back into hieroglyphics? I hope the next version of iOS brings the old keyboard back as an option. I don’t understand why Apple felt it necessary to move things around. The old keyboard is still there. If you don’t like the new one handed keyboard that’s pushed to the side, you can go to settings>general>keyboard>one handed keyboard and set it off instead of right or left. Then you will have the old keyboard whenever you need to type. Alternatively, whenever you have the keyboard on screen just tap and hold on the globe or emoji button and you will also be able to select the regular keyboard from there. On another note, the article doesn’t mention it but Apple seems to have listened to complaints from many users regarding 3d touch: in the new ios 11.1 beta 2, they have brought back the 3d touch shortcut that allowed to access the task manager by hard pressing on the left edge of the screen. The feature had been present in ios 10 and earlier versions but was missing in ios 11 until now. The old keyboard is still there, just tap and hold on the globe or emoji button and select the center option to disable the new one handed keyboard. Or go to settings>general>keyboard>one handed keyboard and make sure it’s set to off. By the way, and although the article doesn’t mention it, one feature apple did bring back with this new beta due to user complaints was the 3D shortcut that allowed to access the task manager by hard pressing the left edge of the screen on iphone 6s or later. The 3D touch shortcut actually wasn’t a planned removal, there were just technical limitations. If they wanted to remove it, they would’ve just made it a switch in settings that’s off by default. The old keyboard is still there. Just go to settings>general>keyboard>one handed keyboard and set it to off. Then you will get the traditional keyboard next time you enter any app where you can type text, such as messages or safari. You can also disable one handed keyboard by tapping and holding on the globe or emoji button while you have the keyboard on screen. The article doesn’t mention it, but in addition to the new emoji, iOS 11.1 beta 2 brings back the 3D touch multitasking feature that had been removed in iOS 11. In other words, it restores the ability to open the app switcher by hard pressing the left edge of the screen on iphone 6s or later devices. Does it also restore the ability to have a numeric indicator for the cell signal strength through the Field Test built-in app? I hope 10.13.1 actually works. Gets the login screen back without pulling out HDMI cable on 2011 Mac mini. allows me to see email, without massive black boxes on the mail screen. Also that Server is updated to well, actually SERVE! You know, iOS/WebDAVS support put back!